Mish's Global Economic Trend Analysis: Syriza Trounces New Democracy; Greeks Stop Paying Taxes; Run on Greek Banks Escalates; Get Out! Syriza Trounces New Democracy; Greeks Stop Paying Taxes; Run on Greek Banks Escalates; Get Out! As late as yesterday I read numerous mainstream media reports that Syriza would win by three to five percent and would need to form an unstable coalition to rule. In contrast, here was my January 19 prediction (and rationale): Expect a Blowout Win by Syriza in Greece. The final votes are not counted, but exit polls show a blowout, with incumbent party New Democracy going down in flames. The Wall Street Journal reports Greece’s Radical Leftist Syriza Party Poised to Win Election, Exit Polls Say. Syriza appeared set to win between 35.5% and 39.5% of the vote, trouncing the incumbent New Democracy party, which managed to secure just 23% to 27% of the vote, according to the exit polls whose results were issued immediately after voting booths closed. If Syriza is able to secure more than 150 seats on its own—which the exit polls show is possible—it won’t need coalition partners and will have a freer hand in implementing its platform—something that could lead to ruptures with Greece’s creditors. 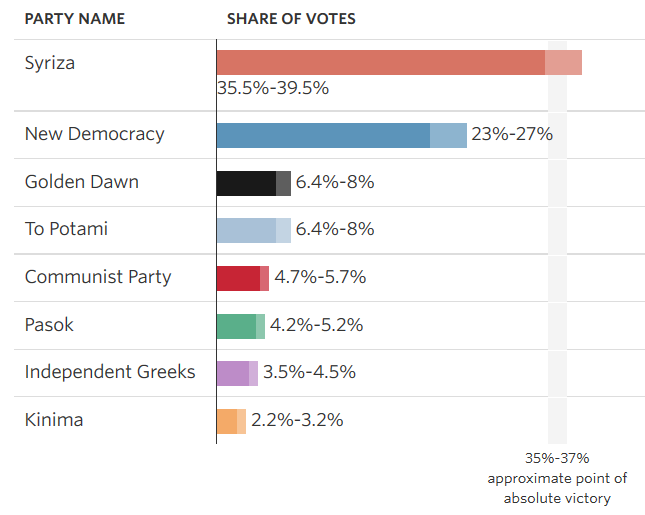 The polls also showed that voters backed a handful of smaller parties—ranging from the extreme-right Golden Dawn party to the centrist To Potami party—making it unclear whether Syriza would win an absolute majority in Greece’s 300-seat legislature. According to the polls, Syriza was projected to secure between 146 to 158 seats, depending on the final outcome. Note the double-digit (or near double-digit) trouncing of New Democracy leader and current prime minister Antonis Samaras. Here's an interesting quote from the Journal. Late last week the Financial Times reported Greeks Stop Paying Taxes in Expectation of Syriza Poll Victory. A reluctance to pay taxes was much criticised by Greece’s creditors as one reason why the country needed a big international bailout. Now many Greeks are again avoiding the taxman as they bet the radical left Syriza party will quickly loosen fiscal policy if it comes to power in Sunday’s general election. A finance ministry official confirmed on Friday that state revenues had collapsed this month. “It’s normal for the tax take to decline during an election campaign but this time it’s more noticeable,” the official said, avoiding any specific figures on the projected shortfall. However, two private sector economists forecast the shortfall could exceed €1.5bn, or more than 40 per cent of projected revenues for January. Angeliki Mousouri, a dentist who is paying off more than €20,000 of tax arrears, said she missed a monthly instalment due in December. Syriza is set to win the election even though it may not achieve an outright majority, according to opinion polls. Three polls published on Friday showed Syriza leading the centre-right New Democracy party of Antonis Samaras, the prime minister, by 4-5 percentage points. As late as last Friday polls expected New Democracy would lose but not get trounced. ZeroHedge reports Greek Deposit Outflows Soar In Run-Up To Syriza Victory. The above paragraphs not by ZeroHedge but rather from JPMorgan (no link given). I repeat my January 9 warning: Another Run on Greek Banks Begins; Get Out While You Still Can; Buy Gold. There is no reason to hold money in Greek banks, and every reason not to (even if there is talk of ECB guarantees). At this point, the "Juncker Rule" applies (they will lie when it's serious). By get out, I do not mean to another European bank. If I were a Greek citizen, I would personally worry that any euro-denominated bank (not just Greek banks) would confiscate my money. For short-term needs, consider US dollars or euros, in hand, not in Greek bank safe deposit boxes. For mid- to long-term needs, US treasuries (or US treasury ETFs), German bonds (or German bond funds), and gold look attractive, especially gold.